Exploring the fascinating and oft-ignored facet of surrogacy within Korean history and culture, With or Without You is a highly impressive documentary from director Park Hyuck-jee (박혁지) and is certainly one of the better discoveries in the K-Competition program. As the only documentary within the category there could arguably be a sense of pressure, yet from the moment With or Without You opens the cinematic quality of the film is clearly apparent, and continues to become increasingly compelling throughout the entirety of its running time. The film documents the lives of elderly widows Maggi (막이) and Chun-hee (춘희) as they toil in the sweltering heat of the Korean countryside planting and harvesting crops. Their physicality is continually arresting, as their backs are quite literally bent at right angles from decades of farming and their gnarled, labourers fingers still work the soil, a stark contrast with the beautiful landscapes in which they reside. Director Park produces some absolutely exquisite cinematography during the course of the film that wonderfully captures the elegance of the rural area in conjunction with the abject poverty of the local populace, combining to create an array of conflicting emotions that is never anything less than utterly absorbing. The real power of With or Without You lies in the complex history shared by Maggi and Chun-hee. Maggi – a wonderfully stubborn and cynical, yet kind-hearted woman – explains that in her youth she gave birth to an incredible amount of children in order to continue her husband’s family name, yet through history and circumstance, the male children all died. During that era a family would panic if there were no sons to continue the bloodline, and as such Chun-hee was literally ‘bought’ in order to provide heirs. Yet after giving birth Chun-hee stayed at Maggi’s request, and 46 years later the duo continue to take care of each other. Their history, and the details that gradually emerge over the course of the running time, are powerful insights into a seemingly forgotten cultural practice and resonate poignantly with every revelation. Director Kim wisely depicts the great sense of friendship between the women through key scenes, yet isn’t afraid to also employ bizarre comedy of their situation to add levity. Scenes involving Maggi attempting to teach Chun-hee, who has learning difficulties, how to count money are as touching as they are humorous. When they visit a hospital for Chun-hee’s health check and Maggi describes their relationship to the doctor, his facial expression is priceless. 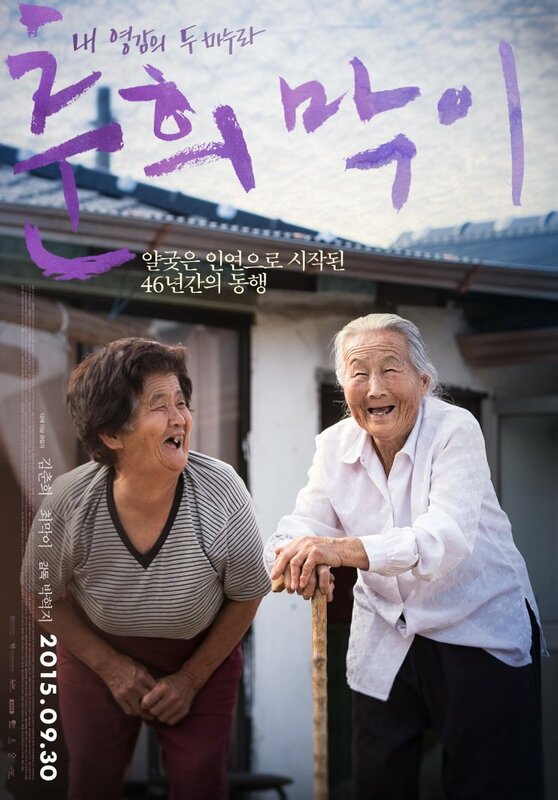 With the inclusion of scenes involving their children, director Kim manages to touch on the potent social issue of the uninterested in caring for elderly relatives, a reality that ironically forces both ladies closer and making their interactions even more heart-warming and astute. Yet With or Without You is not without faults. Just as with last year’s hit documentary My Love, Don’t Cross That River, the film doesn’t delve further into the incredible history of both the central protagonists and the era in which they met, which are missed opportunities, while the issues involving children would benefit from greater exploration. That said however, With or Without You is a charming and poignant documentary, and one which exposes a largely forgotten yet pivotal role women played in the continuation of Korean bloodlines. With or Without You is a fascinating and absorbing documentary regarding the role of surrogacy in Korean history. Director Park Hyuck-jee employs exquisite cinematography in depicting the lives of elderly farmers Maggi and Chun-hee, two charismatic and resolute women whose complicated history is continually poignant. While the film occasionally misses opportunities to explore said history in further detail, With or Without You is still certainly one of the better discoveries at JIFF 2015.